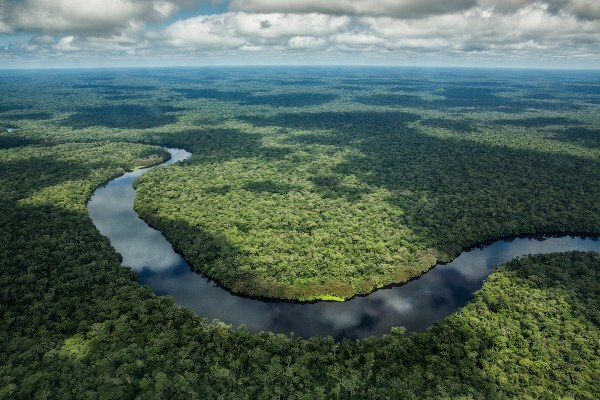 Salonga National Park is Africa’s largest tropical rainforest national park located in the Congo River basin. It stretches into the provinces of Bandundu, Equateur, Kasaï Occidental and Kasaï Oriental. The Salonga is a remote wilderness, primarily accessible by water or air. It is comprised of two land blocks of roughly equal size, separated by a 40 km corridor. Birds in Salonga national park; The park also has wide-range of birds including the 101 species of birds that have been recorded and 153 may be confirmed. Birds include cattle egret Bubulcus ibis, black stork Ciconia nigra (migrant), yellow-billed stork Mycteria ibis, the African grey parrot Psittacus erythacus, a popular species for sale, and the endemic Congo peafowl Afropavo congensis. A list of birds from the Park has recently been compiled by Van Krunkelsven. In spite of Salonga‘s protected status as largest tropical rainforest national park endowed with unique wildlife species notably the endangered species of Bonobo or pygmy chimpanzee Pan Paniscus as well as unique bird species, there have been very few visitors in the past because of the lack of infrastructure and access, and more recently, civil war. However, the post at Mundja is accessible by air. 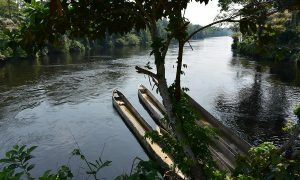 The park remains relatively accessible along a network of rivers, navigable by dugout canoe, that traverse both sectors of the park in an east-west direction and by several abandoned roads around parts of the park periphery that are still traversable by foot and bicycle. Bonobo or pygmy chimpanzee Pan Paniscus -The Salonga represents the largest expanse of legally protected bonobo habitat in DRC. The park protects approximately 15,000 individuals, or possibly 40% of the world’s bonobo population. 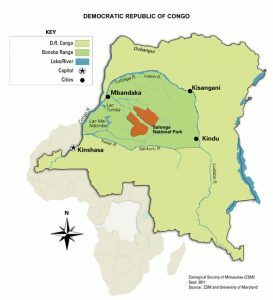 It is the only protected area in DRC where bonobos and elephants still occur together in substantial numbers and where elephants still play a major role in forest regeneration and growth. The equatorial forests of the Democratic Republic of Congo (DRC) house a truly special kind of ape and one of man’s closest relatives: the bonobo. Bonobos almost share 98.5% of the same DNA with humans and hence they possess very human-like qualities. They embody a profound intelligence and a deep emotional capacity. In fact, in captivity, bonobos have picked up on many facets of human culture, sometimes simply through observation of the researchers around them. They have learned how to communicate in human languages, use tools, play music, and in one case, a bonobo actually tried her hand at driving a golf cart (only to crash into a tree shortly after). Physically, they resemble chimpanzees, a close relative. In fact, bonobos are sometimes referred to as pygmy chimps because scientists first believed bonobos were a subspecies of chimpanzees. Further inspection revealed differences, and scientists later categorized them as their own unique species. With a more upright skeleton, long legs, and narrow shoulders, bonobos have the ability to walk bipedally, or on two legs, more easily and for longer amounts of time than chimpanzees. Their skeletal anatomy is actually very similar to Australopithecus, an early ancestor of humans. Their faces are flatter with a higher forehead than those of chimps, and their long black hair parts in the middle. When a female reaches sexual maturity, she will join another group. This limits inbreeding and increases genetic diversity among populations. When approaching a new group, the young female will seek out older, high-ranking females and attempt to form a bond through grooming and sexual behavior. 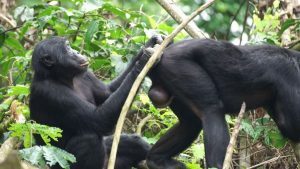 Sexual behavior is predominant in bonobo life. They engage in sexual behavior for a variety of reasons: to form bonds, to neutralize tense situations, to express excitement, to greet one another, to encourage sharing and compassion, and of course, to produce young. They reproduce at the same rate as chimpanzees, giving birth every 5-6 years. A female will bear young for the first time around 13-14 years old. She will nurse and carry her offspring for up to 5 years. Males do not take part in the rearing process. The bonobo species in Salonga national park diet is largely vegetarian. Foraging in small groups, bonobos primarily feed on fruit, but they also eat leaves, flowers, bark, stems, roots, insect larvae, worms, crustaceans, honey, eggs, and soil. Occasionally they hunt small mammals like flying squirrels or duikers (small antelopes). At night, bonobos gather with their groups to nest, communicating with each other with high-pitched barking sounds. The species is omnivorous and inhabits primary and secondary forests, including seasonally inundated swamp forests. These species are commonly seen in the northwest, northeast and southeast margins of the Salonga national Park. Flora/Vegetation in Salonga national park; The National Park covers/occupies over a third of the enormous Salonga-Lukenie-Sankuru forest and is the second largest almost pristine tropical rain forest reserve in the world. Its high (to 45m) equatorial forest trees occupy or cover most of the area, varying in composition. The common vegetation types are swamp, riverine, and dry-land forests. The dominant vegetation types are swamp, riverine and dry-land. Evergreen ombrophile forest is represented by well-developed stands of Gilbertiodendron dewevrei. The Semi-deciduous forest covers/occupy almost all areas between the rivers. Pioneer or transitory communities are found along river banks. Grassland vegetation, rather than savannah, occurs in the north sector, known locally as botoka-djoku (elephant’s bath). The total area of grassland is under 0.5% of the park area. Southwards, the vegetation is more open with esobe clearing. 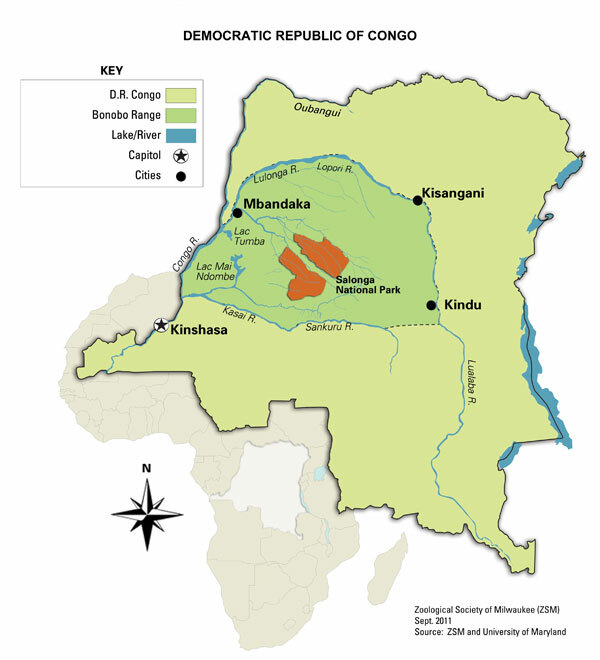 Democratic Republic of Congo is a vast nation in Central Africa. 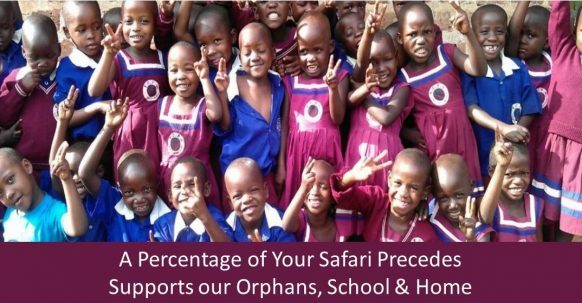 It is at the middle of the dense Equatorial jungle of Africa. The vast Salonga National Park spanning on an estimated area of 36,000kms contains the most significant evolution of both species and communities in a forest area still relatively intact. It also Plays the most fundamental role for the climate regulation and the sequestration of carbon, it constitutes the habitat of numerous threatened species such as the pygmy chimpanzee (or bonobo), the bush elephant. The pristine Salonga National Park currently managed by the ICCN (Institut Congolais pour la Conservation de la Nature) has unique climate described as continental equatorial: hot and humid with a mean annual precipitation of 2,000 millimeters over most of the reserve, falling to 1,700 m in the south, and with a slightly drier season from June to August. Rains are mostly downpours and on only 30 days in the year are precipitation less than 20 mm. The park’s average relative humidity is 86%, regularly reaching saturation at night, but maintaining an average of 77% during the day. Temperatures are stable with daily mean variations between 20°C at night and 30°C during the day. The mean annual temperature is 24.5°C. Cloud cover is often complete until 10 a.m. and is associated with fog and storms from midday to 3 p.m., but skies are often clear at night to 4am. Straddling on three landscape types i.e., river terraces, low plateaux and high plateaux, Salonga national park covers over a third of the immense Salonga-Lukenie-Sankuru forest and is the second largest pristine tropical rain forest national park in the whole globe. Its high (to 45m) equatorial forest trees occupy or cover most of the area, varying in composition. The common vegetation types are swamp, riverine, and dry-land forests. The dominant vegetation types are swamp, riverine and dry-land. Evergreen ombrophile forest is represented by well-developed stands of Gilbertiodendron dewevrei. The Semi-deciduous forest covers/occupy almost all areas between the rivers. Pioneer or transitory communities are found along river banks. Grassland vegetation, rather than savannah, occurs in the north sector, known locally as botoka-djoku (elephant’s bath). The total area of grassland is under 0.5% of the park area. Southwards, the vegetation is more open with esobe clearings. Salonga National park is endowed with variety of wildlife species, notably the endangered bonobos, Dryas monkeys, Thollon’s red colobus, Congo peacock, leopards, forest elephants, and African slender-snouted crocodiles. 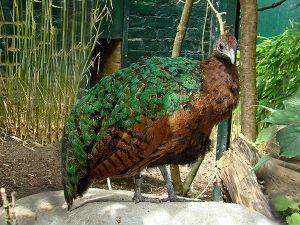 Other wildlife species well represented in the park include the long-tailed pangolin, giant pangolin, tree pangolin, Angolan slender mongoose, aquatic genet, hippopotamus, the African golden cat, bush pig, bongo, yellow-backed duiker, sitatunga, okapi, bushbuck, water chevrotain and pygmy Cape buffalo. Besides wildlife, avifauna is also present and some of the larger bird species are the cattle egret, black stork and yellow-billed stork. In regard to Cultural heritage, a group of about 800 Iyalima occupies the western Dekese zone in the southeast of the park in eight villages, living in harmony with the forest. Since the Park’s creation, their occupation of their own lands has been officially illegal. In 2003, the Lukuru Wildlife Research Project (LWRP) initiated /introduced a drive to formalize their status under newly revised conservation laws. In recent years, Bantu groups from different independent African Christian movements, some seeking refuge from state pressures, have moved and settled into the Park: For instance the Kimbanguistes in the south and Kitawalistes in the north near Lomela. Both are in contact with poachers and there are planners on-going to relocate or move them outside the central zone of the park. The Bianga community in the south survives by poaching and farming within the Park. Local farming is based on manioc, maize and banana, with coffee, rice, oil palms and rubber trees and, with traditional fishing, hunting and gathering, continues in the buffer zone.